Ivan, an enormous silverback gorilla lived in a glassed-in cage in a circus-themed mall for 27 years. 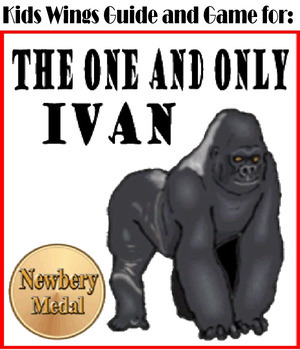 Now, in The One and Only Ivan, you can read his story, as he would have imagined it to be true. Ivan introduces you to his special friend, an old elephant named Stella, who lives in a cage next to his. 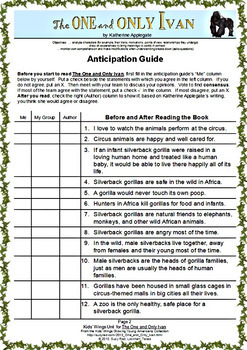 She tells Ivan the story of how she happened to come to the mall and the story of a boy who fell into a gorilla's enclosure in a zoo. When she asks Ivan to share his story, he says he could not remember. After all, remembering just wasn't a gorilla's special talent ... that was an elephant's talent. Nevertheless, she continues to encourage him to remember. All Ivan can remember is that Mack, the owner of the Big Top Mall, who had bought him when he was an infant and raised him as his own son for as long as he could. Ivan couldn't help being destructive; he WAS a gorilla. He does have other friends. One day, a little homeless puppy squeezed into Ivan's domain and went to sleep on his enormous stomach. He became a special friend to Ivan. Ivan is basically content at the mall. He never gets angry like the billboard outside advertises. He never lets himself think about getting out. Where is there to go? Mack feeds him well. He even gives Ivan crayons and paper to draw pictures and when Ivan gets tired of drawing, they make a nice snack. Ivan considers himself an artist, and luckily, a girl named Julia visits him every day. She is an artist, too! When Mack buys a baby elephant named Ruby, things began to change. There's just nothing like having a baby around to pep things up, but those weren't the only changes she brought. She becomes a reason for ... oh, you want to read this story for yourself, don't you? The One and Only Ivan will tell you surprising things about how animals are trained to perform in circuses and how they are treated day by day. (Did you think that elephants enjoy balancing on small stools or walking in circles?) You will laugh at Ivan's antics and his attempts to be a good human, and at Ruby's innocence, but you will need some tissues as you read the reality of what animals in captivity face. The book will spark empathy or compassion, the trait upon which all other character traits are built, and perhaps motivate you to take a stand. 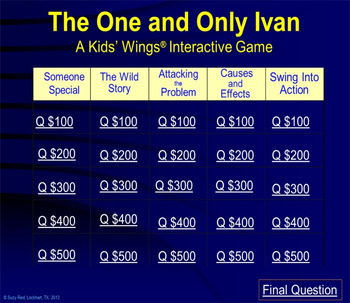 The Kids Wings literature guide and Jeopardy-type game provide beautifully planned curriculum that leads to the development of character, academic skills, team building, and guarantees thoughtful social and exciting academic growth for every classroom. 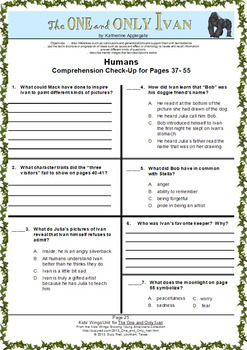 The Literature Guide in this unit is delivered in both PowerPoint and PDF formats.